For $16,900, Go Slow Pacer! Go Slow Pacer! Go Slow Pacer, Go! Upon its introduction, some called AMC's uniquely styled Pacer the Flying Fishbowl. Today's Nice Price or Crack Pipe wagon edition is a bigger bowl, but is there something fishy about its price? The E30 Touring was the most commodious of all the small BMWs of that era, although apparently not sufficiently so as yesterday's rare in the U.S. silver salmon edition proved too small for its fifteen large asking price. At least that was the opinion of the 72% of you who dropped the Crack Pipe bomb on it. Today, we're going to stick with the wagons, but are going to pick up the pace. When first envisioned by the high-up muckity mucks at AMC back in the early ‘70s, the car that eventually would become the Pacer was intended to embrace a number of innovative technologies including front wheel drive and a rotary engine. Unfortunately for the cash-strapped company from Kenosha, there wasn't the resources - either of finances or infrastructure - to build a front driver, and the gas crunch killed both Curtis' and GM's Wankels. What did eventually hit the market in 1975 was still a radical departure from anything else offered by either foreign or domestic car makers. A singularly rotund design, the Pacer featured enough glass to tax any A/C system, as well as a passenger door that was cleverly longer than the driver's side as that's where most back seat passengers would enter and exit. Of course they never explained why they didn't just make both sides long. One complaint of the Pacer was its limited load capacity, owing to a relatively short 100-inch wheelbase. 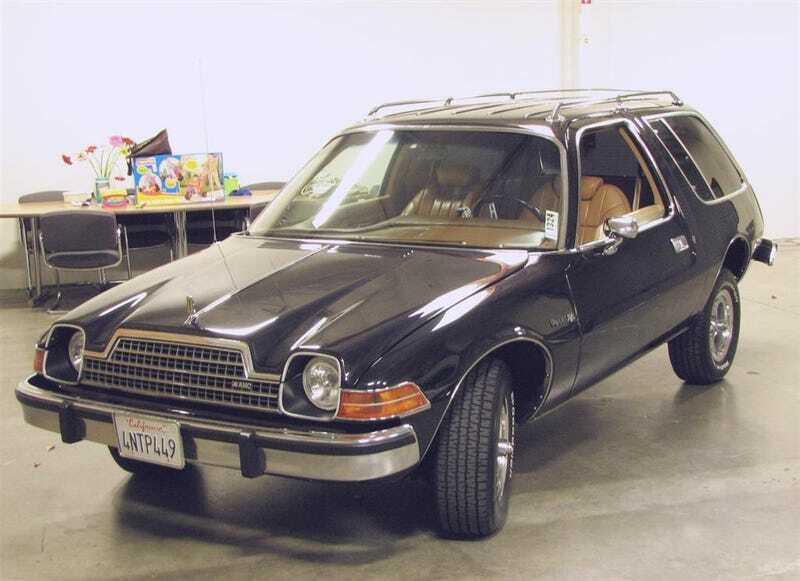 Possibly as a result, AMC introduced the Pacer Wagon in 1977, and while it didn't grow between the wheels, its more squared-off backend looks well proportioned with its 5 added inches of overhang which allows for more junk in the trunk. This 1978 Pacer D/L wagon still brings the funky to this day, although its near showroom appearance indicates that its previous owner did not possess the car for its ironic nature. Round all the way around is the best way to describe a Pacer, and this one disproves the old maxim that black is slimming. That paint gleams like new, as does the copious quantity of chrome and brushed metal brightwork, including a roofrack! The back end looks as high as that kid in back of your first period math class, but in this case that's due to what appear to be shackle extenders on its remarkably long cart springs. Those keep the live axle from rolling away, the front end being managed by a-arms with turning action provided by rack & pinion power steering. The wheel arches are filled with BF Goodrich Radial T/As, wrapped around five slot mags. Those are some pretty sporty shoes for a car as fat and conservative as Rush Limbaugh, but don't expect it to raise a lather due to liberal application of the gas pedal. The general lack of oomph is because under the bumped-up hood rests not a rotary but AMC's tried and true 258-cid OHV straight six, fed by a puny single barrel carb. That was good for 100-bhp, although it's questionable how many of those ponies the 3-speed automatic lets out of the corral. Starting out an upscale D/L this Pacer wagon is pretty well kitted out option-wise, having A/C, a gnarly AM/FM 8-track stereo, and what looks to be a diamond-encrusted cobra's head on the column shifter. Sadly, all that, plus the cast iron boat anchor under the hood, conspire to make this Pacer a candidate for Jenny Craig. Even if it tips the scales at well over a ton and a half, much like Kirstie Alley, it looks good while tipping it. YMMV. The interior features wide bucket seats covered in light brown vinyl, and the dash and carpet are hued to match. Despite all that glass area, the interior doesn't look like it has endured the ravages of the sun, nor are there any major flaws inside - other than a center console lid that appears to have suffered driver's elbow. The seller says everything works and a quick glance at the IP picture shows it only has about 54K on its clock. If you have a thing for the products of the now defunct American Motors Corporation, you will be hard pressed to find an example of the Pacer wagon in this nice of shape outside of a museum or some weirdo's private collection. That's a fact that has not eluded the dealer offering this Pacer. His asking price is $16,900 and represents the highest price point of this week. Now it's up to you to determine if that's a reasonable number of goldfish to drop into this bowl. Or, if that price makes it time to cut bait.